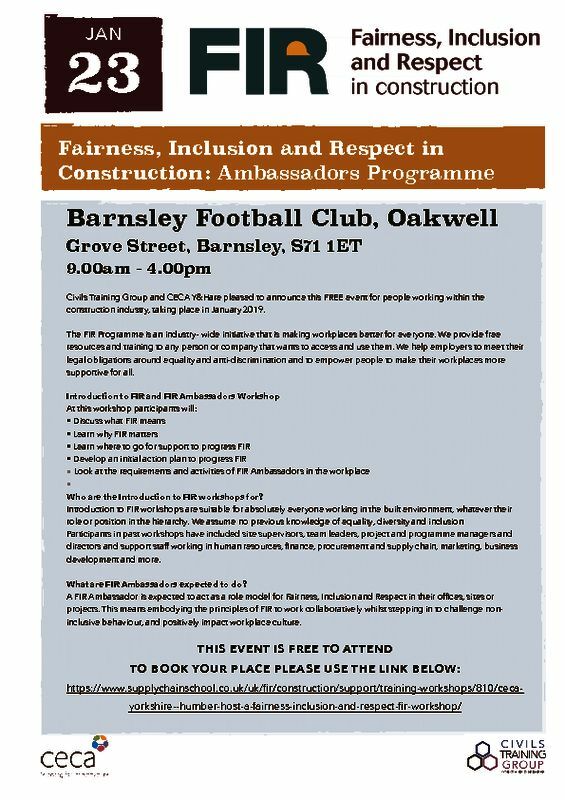 Civils Training Group and CECA Y&H are pleased to announce this FREE event for people working within the construction industry, taking place in January 2019. The FIR Programme is an industry- wide initiative that is making workplaces better for everyone. We provide free resources and training to any person or company that wants to access and use them. We help employers to meet their legal obligations around equality and anti-discrimination and to empower people to make their workplaces more supportive for all. Who are the Introduction to FIR workshops for? Introduction to FIR workshops are suitable for absolutely everyone working in the built environment, whatever their role or position in the hierarchy. We assume no previous knowledge of equality, diversity and inclusionParticipants in past workshops have included site supervisors, team leaders, project and programme managers and directors and support staff working in human resources, finance, procurement and supply chain, marketing, business development and more. What are FIR Ambassadors expected to do? A FIR Ambassador is expected to act as a role model for Fairness, Inclusion and Respect in their offices, sites or projects. This means embodying the principles of FIR to work collaboratively whilst stepping in to challenge non- inclusive behaviour, and positively impact workplace culture.